As a foremost business organization, we have come up with a huge assortment of Semi-Automatic Low Height Box Strapping Machine to our clients. These provided products are made-up by making use of supreme quality basic material altogether with progressive tools and machinery. Along with this, these products are accessible at very inexpensive rates in varied modified options. 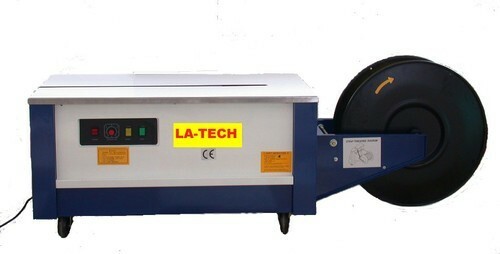 To assist various needs of consumers, our firm La - Tech Engineering is offering best quality approved industrial machines. Incepted in the year 2006, it has been almost a decade, our firm is reputed manufacturer and supplier of Box Strapping Machine, Hand Strapping Tool, Pouch Sealing Machine, Foot Operated Padder Sealer, Hand Sealer, Shrink Wrapping Machine, Stretch Wrapping Machine. These products are best in quality and safe to use up to longer years. Professionals make these machines very precisely by following latest engineering and using best components. In addition to this, these presented machines are easier to install and made of rust proof metal that remain sustained up to longer years. These are widely demanded in mechanical industry, packaging sector and many other areas to assist diverse industrial needs.